Japan is a wondrous, exotic land, full of iconic places, pop-culture galore, and a perfect marriage between the old and the new. Among one of Japan’s most iconic symbols is the Shinkansen bullet train, an incredible piece of engineering and technology that links major cities in Japan in just a few hours. Throughout the years, Japan has been expanding and improving its railway system to cover the majority of each island and facilitate traveling all together. That is why in March of 2016, the Hokkaido Shinkansen, linking Aomori on Japan’s main island of Honshu with Hakodate on the island of Hokkaido via the Seikan Tunnel, was inaugurated. Until then, access to Hokkaido was challenging, but now with only one transfer, you can get there faster. 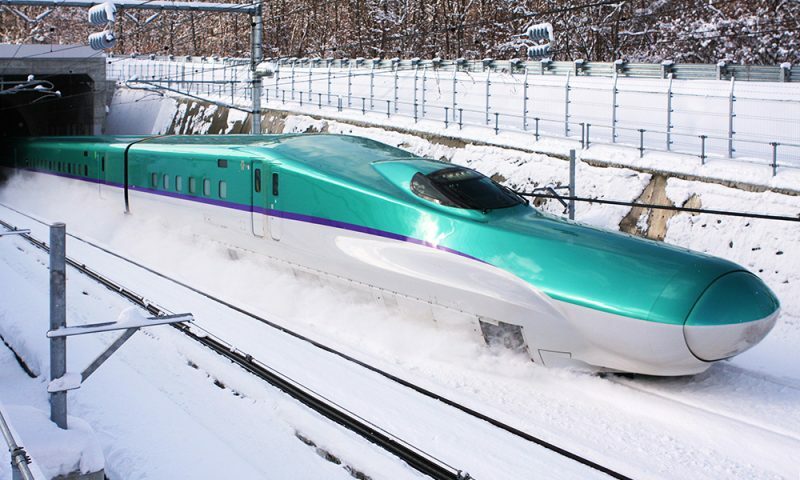 The Hokkaido Shinkansen will be extended to Sapporo, and it is scheduled to open by 2030. Japan Rail Pass covers the new Hokkaido Shinkansen route, including the super fast Hayabusa train. The JR Pass is really worth it if you are taking this route: as a normal ticket would cost 23,120 yen for the round-trip. Currently, two trains are operating on the Hokkaido line: Hayabusa and Hayate. The majority Hokkaido Shinkansen trains are Hayabusa, which run between Tokyo Station and Shin-Hakodate-Hokuto Station, and seat reservation is required. The journey from Tokyo to Hakodate takes approximately 4 hours and 4 minutes. The Shinkansen Hayabusa goes all the way to Shin-Hakodate-Hokuto, located between Hakodate and Hokuto. Once you arrive, you will need to take the local Hakodate Liner to reach the city of Hakodate. Hayate trains usually operate one return service per day during the morning and late evening between Morioka and Shin Hakodate and one return service per day between Shin Aomori and Shin Hakodate. Again, it is mandatory to book your seat before boarding the Hayate train, since there are no non-reserved cars. If all reserved seats have already been booked, standing tickets will be made available. Once in Shin Hakodate, the Hakodate Liner operates 16 shuttle services per day to reach Hakodate station. The Hakodate Liner connects Shin-Hakodate-Hokuto Station and Hakodate Station in just 15 minutes and links the shinkansen with all train lines with 16 round trips operating per day. Travel times are 15 to 22 minutes and ten return services are scheduled per day. Once you get to Shin-Hakodate-Hokuto station, to get to Hakodate, the connection is easy thanks to the Hakodate Liner. Once you get to Hakodate, it is easy to discover the city with the shuttle bus or the streetcar. It is very easy to get to Sapporo: once you get to Shin Hakodate station, you need to take the Ltd Express Super Hokuto or Express Hokuto (3h30). The shinkansen line addition from Shin-Hakodate-Hokuto to Sapporo Station is scheduled to open in 2030. From Sapporo, you can easily get to New-Chitose Airport taking a Rapid Airport Express via the JR Chitose line, which is also included in the JR Pass. From Sapporo, you can easily get to New-Chitose Sapporo: once you get to Shin Hakodate station, you need to take the Ltd Express Super Hokuto or Express Hokuto (3h30). The shinkansen line addition from Shin-Hakodate-Hokuto to Sapporo Station is scheduled to open in 2030. The Hokuto and Super Hokuto are limited express train services between Sapporo and Hakodate in Hokkaido operated by Hokkaido Railway Company (JR Hokkaido). It takes The journey time of the Super Hokuto is approximately 3 hours 40 minutes, 10 minutes faster than that of the Hokuto. Super Hokuto services started on 1 March 1994, and cut journey time by about 30 minutes due to the higher speeds through the many curves of the line between Sapporo and Hakodate. 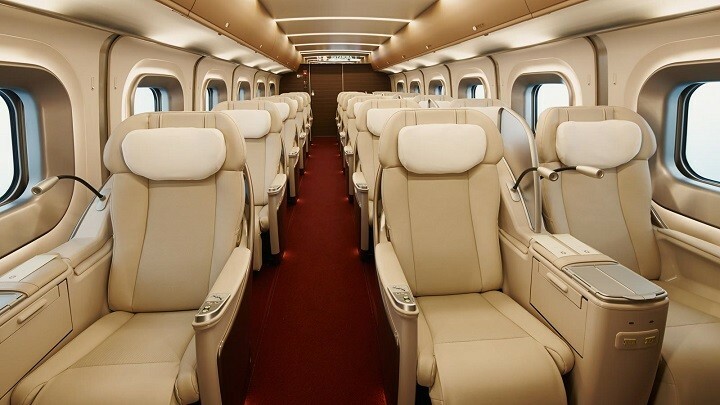 The Hayabusa trains feature Gran Class cars – first-class travel that far exceeds that of the green class. The Gran Class involves the use of a special train car with ample seating room, as well as the constant attention of your host or hostess. Trains generally have one Gran Class car along with standard and green cars. 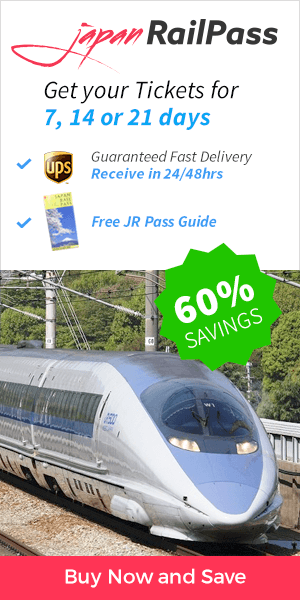 The train fare itself is covered by the Japan Rail Pass, but holders must pay for an additional Gran Class charge, that is, the difference to the standard or Green Class ticket (depending on your pass). These charges vary slightly for a Hayabusa ride or for a Hayate ride from Shin-Aomori to Tokyo. The Hokkaido Shinkansen really helped bridge Tokyo and Hakodate. Before, it took 5hrs and 30mins from Tokyo to Hakodate, but on the Hokkaido Shinkansen it takes 4 hours and 2 minutes to reach Shin-Hakodate – Hokuto Station. The goal for the Hokkaido Shinkansen is for it to reach Sapporo. 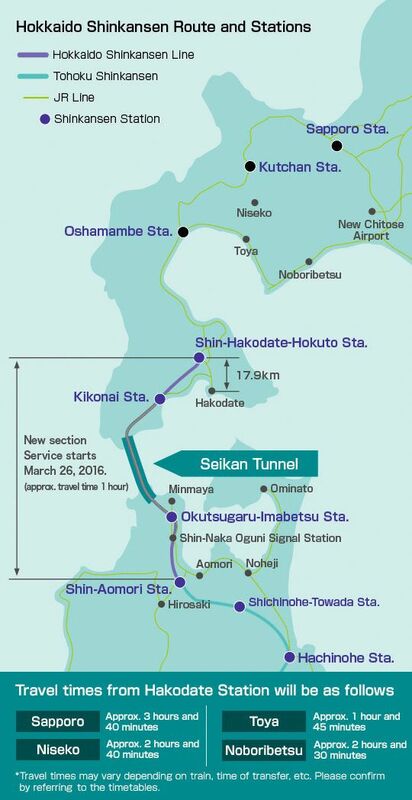 The extension from Shin-Hakodate-Hokuto to Sapporo is planned to open by March 2030.Tunneling work on the Murayama tunnel started in March 2015 and is scheduled to be completed by March 2021. The 211.3 km extension will be approximately 76% in tunnels, including major tunnels such as Oshima, Teine, and Shiribeshi. Finally, when the section to Sapporo opens, the estimated travel time from Tokyo to Sapporo will be roughly 5 hours. The Shinkansen ride from Hakodate to Tokyo from is very comfortable (posting this while still on the bullet train, in fact). Didn’t even realise when we crossed between islands! No hot food on the train so pack a lot of snacks. The JR Pass is well worth it!